The running was held on Sunday, 16 June 2013. I arrived in Bali airport on Saturday, 15 June 2013 using Citilink flight from Jakarta. It was nice airline with new fleet Airbus A320. The flight was smooth and safe. I took a picture of the sky from the plane. 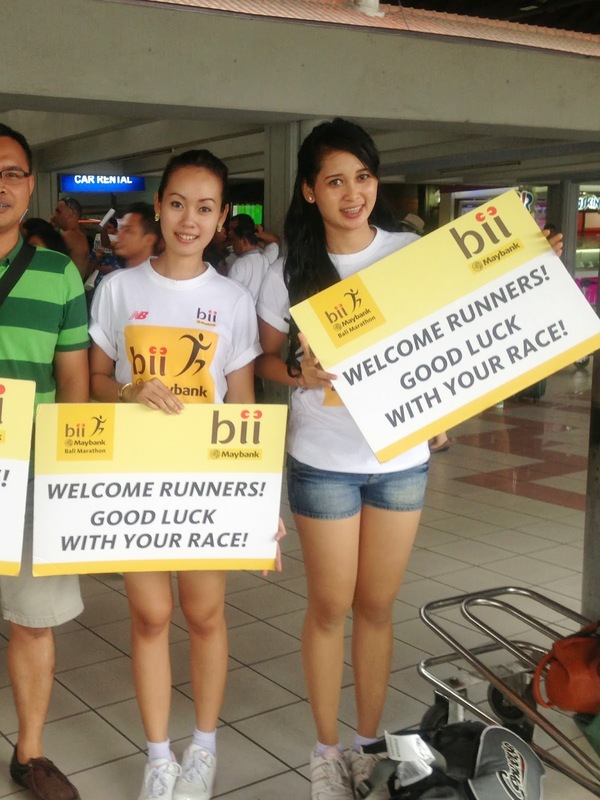 There are some ladies from race committee welcomed you at the airport and we could took picture with them and holding sign "welcome runner". I tried taking picture with them. They also gave me rundown schedule. Racing kit had to be taken in Nusa Dua. There was carbo dinner in Nusa Dua but not for free. Luckily I have cousin who live in Bali. She helped me to take racing kit. Then, I went directly to the hotel at Kuta Centrak Park Hotel. I booked the hotel two days before the race from www.agoda.com and got the good price. The hotel is nice and clean. I like the swimming pool. At night i met with my cousin, her husband and their baby. I had been more than 15 years since the last time i met her. She brought me racing kit that contains t-shirt, bib numbers and some souvenirs from sponsors Before sleeping, I went to Giant grocery store. It just walking distance from the hotel. I bought some snacks, fruits and cookies, just in case I got starving at mid night. After spent several hours at Sun Bear Sanctuary in Samboja. We drove to Bangkirai Hill Rain Forest Canopy Walk for about an hours. Half of the road is quite good, the rest we faced some terrible road condition. It is recommended to drive there using 4-wheels car. On the way there, we crossed woods, palm oil plantation and coal mining site. The location is 58 km from Balikpapan to the north. Bangkirai is part of Kutai Kartanegara District, in East Kalimantan Province. There is no public transport from Balikpapan to here, so visitor have to rent a car from Balikpapan or Samarinda. I went to Manado, the capital city of North Sulawesi province in Indonesia end of July 2014. This was my first time travel to Sulawesi Island. Yes, my country is a large with more than 17,000 islands! Sulawesi is one of five big island in the country. Manado can be reached by 3 hours flight from Jakarta, the Indonesia capital city. If you travel from Singapore, SilkAir provides direct flight to Manado. Many people know Taman Safari (Safari Park) in Cisarua, Bogor, West Java as a big zoo that people can see the animals walk freely while we are observed them inside the car. It is located around 70 km from Jakarta, the capital city of Indonesia. You can reach this place by car or taxi. This place is mostly very crowded on weekends. You have to leave from Jakarta early morning between 6-7 am to avoid bad traffic jam. Let's back to Safari Trekking or it is called "Safari Trek". Taman Safari provides trekking package that combined with outbound. The total trekking path is 9 km. The outbound location is at 3rd km. But we choose to take trekking only. We can book in advance at +62-21-500212. The minimum are 10 people for weekend and 25 people for weekday. We were 9 people so we paid 550,000 rupiah. The price include traditional snack (at that time was hot corn boiled with hot tea that is provided at 3rd km), outbound activities and free guide. Balikpapan is the capital city of coal, oil and gas industry in Kalimatan. The economy is driven by these sectors not by tourism business. Meanwhile, I still found some interesting activity that I could do during my trip there last month. One of them is Sun Bear "Beruang Madu" Sanctuary that is located in 23rd Km of the main road from Balikpapan to Samarinda, the capital city of East Kalimatan province. Sun Bear (Helarctos Malayanus) or Honey Bear (Beruang Madu in Bahasa Indonesia) is one of endanger species. The population is decreasing since a lot of rain forest in Kalimantan are converted into palm oil plantations or coal mining sites.